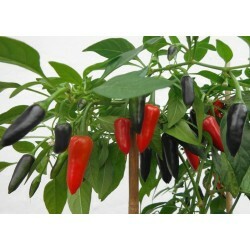 Hot pepper Jalapeno grows up to 1 metre tall. High yield, the fruit matures from green to red. Mostly picked when green. 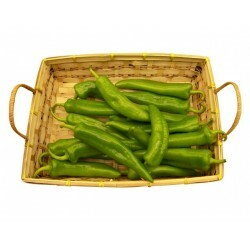 Used in Mexican dishes, sauces. Excellent variety for pickling, and very popular in every country not just here in the UK. Quite easy to grow, recommended for beginner growers. Can be used fresh or can be dried and stored for longer. Many home gardeners don’t attempt to grow chillies because they are under the impression that these fiery peppers can only be grown in tropical climates. That impression is wrong. Since there are many varieties of chillies, at least one variety will be right for growing in your climate, wherever that may be. However, depending on the region you live in and the length of warm summer weather you have, the chillies you select to grow in your home garden may need to be started from seeds and grown a cold frame or under a glass cloche for part of the season. Even if you live in a warm, tropical climate growing chillies from seeds is cost effective plus if you start the seeds indoors it will give a head start on the garden growing season. Select the chilli seeds you want to plant, then spread the seeds out on a double layer of paper toweling. Cover with another double layer of paper toweling and sprinkle with water until the paper toweling is damp, but not soaking wet. Roll or fold the damp paper toweling with chilli seeds and place it inside a zip top plastic bag. Place bag in a warm location (don’t allow sunlight to hit the bag) for 3 days. On day 3, gently open the bag and unfold paper toweling to check on seeds. If chilli seeds have sprouted, it’s time to plant them. If the seeds have not yet germinated and look much like they did 3 days ago, re-wet the paper toweling and place it back into the zip top bag for 2 more days. Check seeds again for germination. By day 5 the chilli seeds should be germinated, if not, the seeds may have been old and it’s time to start the germination process all over again with fresh seeds. Use a seed tray or other type of container to plant chilli seeds into. Use good quality sowing soil mix for the chillies and place two chilli seeds into each section, peppers are hard to germinate so better to be safe; you can always save both seedlings if both seeds will germinate. If using some other type of container, place two germinated seeds together two inches apart. Gently cover seeds with a light layer of dry planting soil, then lightly mist with warm water. Place seed tray or planing container in a warm location out of direct sunlight. Check on chilli seeds every day to monitor their development and to mist with water. It is crucial that the planting soil never dry out during this stage of plant growth. The location should remain a constant 70-85 degrees and be away from air and heat vents for best plant growth. The planting tray or container can be placed on heating pad, electric blanket or on top of the refrigerator to help ensure a steady supply of warmth for the soil and roots of the developing chilli plants. 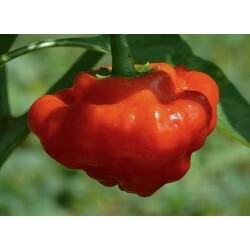 The seeds will take anywhere from 1 - 6 weeks to produce a chilli plant, depending on the variety planted. 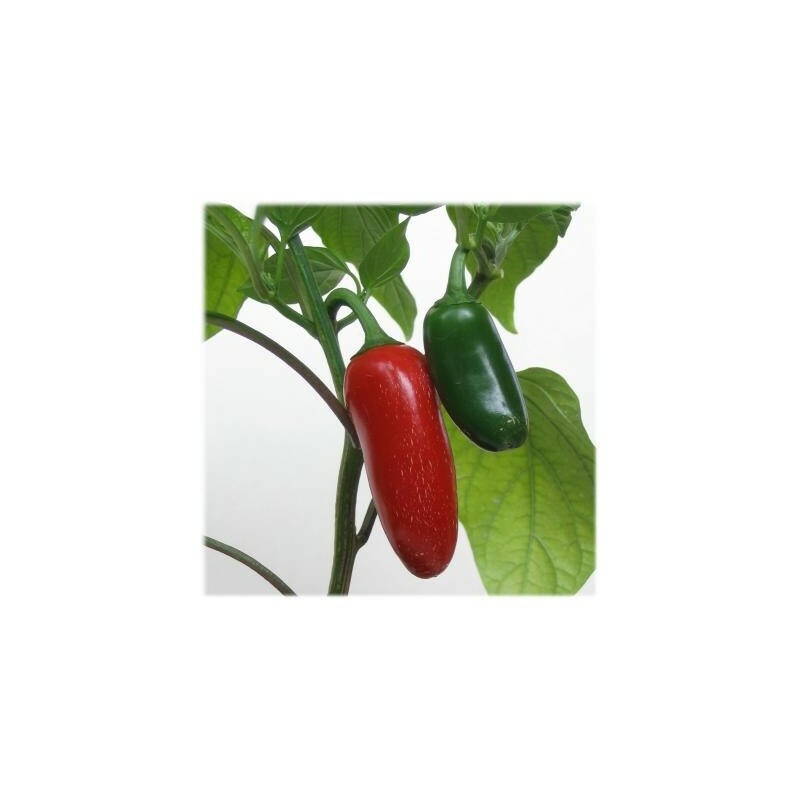 A jalapeno pepper plant will appear in 1-2 weeks, whereas a habenero seed may take up to 6 weeks to produce a visible plant. Once the tiny seedlings have appeared above the soil they will need to be moved to bright location. Providing the seedlings with enough light can be accomplished by placing the plant tray or containers in a sunny window sill or under grow lights. The tiny plants will need 6 - 18 hours a day of bright light and the usage of both sunlight and grow lights are often needed for best results. Plants may become leggy (tall and spindly) during this growth stage, but will bush out when transplanted outdoors. When using artificial grow lights be careful not to place the plants too close to the light bulb or they could get burnt. When all danger of frost has past and the plants have developed their second set of leaves ( called true leaves) it’s time for transplanting the chillies. Prepare planting soil (either in ground or in large pots) by loosening the soil and mixing in compost. 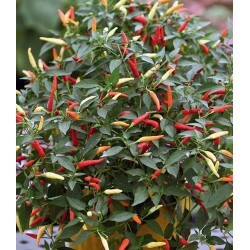 Dig a small hole to place each chilli plant into. If plants are in a seed tray, use a spoon to gently lift out each plant, getting as much soil as possible with each plant, then place into the prepared hole. If plants have been grown in individual containers, turn container upside down and tap on the bottom to release the plant and soil into your hand, then place plant and soil into prepared hole. Fill in gaps around plant roots with soil, gently firm the soil around the roots and water in well. Water new transplants every day for the first week, then water every 2-3 days as needed. Once the plant blooms add a few drops of water soluble fertilizer into the water at every watering.